The QColor class provides colors based on RGB or HSV values. A color is normally specified in terms of RGB (red, green and blue) components, but it is also possible to specify HSV (hue, saturation and value) or set a color name (the names are copied from from the X11 color database). In addition to the RGB value, a QColor also has a pixel value and a validity. The pixel value is used by the underlying window system to refer to a color. It can be thought of as an index into the display hardware's color table. The validity (isValid()) indicates whether the color is legal at all. For example, a RGB color with RGB values out of range is illegal. For performance reasons, QColor mostly disregards illegal colors. The result of using an invalid color is unspecified and will usually be surprising. 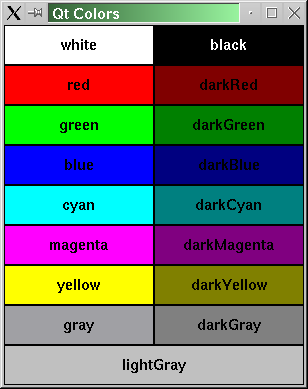 There are 19 predefined QColor objects: white, black, red, darkRed, green, darkGreen, blue, darkBlue, cyan, darkCyan, magenta, darkMagenta, yellow, darkYellow, gray, darkGray, lightGray, color0 and color1, accessible as members of the Qt namespace (ie. Qt::red). The colors color0 (zero pixel value) and color1 (non-zero pixel value) are special colors for drawing in bitmaps. Painting with color0 sets the bitmap bits to 0 (transparent, i.e. background), and painting with color1 sets the bits to 1 (opaque, i.e. foreground). Is the pixel value valid? If it is, just return it; otherwise, allocate a pixel value. Check an internal hash table to see if we allocated an equal RGB value earlier. If we did, set the corresponding pixel value for the color and return it. Try to allocate the RGB value. If we succeed, we get a pixel value that we save in the internal table with the RGB value. Return the pixel value. The color could not be allocated. Find the closest matching color, save it in the internal table, and return it. A color can be set by passing setNamedColor() an RGB string like "#112233", or a color name, e.g. "blue". The names are taken from X11's rgb.txt database but can also be used under Windows. To get a lighter or darker color use light() and dark() respectively. Colors can also be set using setRgb() and setHsv(). The color components can be accessed in one go with rgb() and hsv(), or individually with red(), green() and blue(). If you need to allocate many colors temporarily, for example in an image viewer application, enterAllocContext(), leaveAllocContext() and destroyAllocContext() will prove useful. Because many people don't know the HSV color model very well, we'll cover it briefly here. The RGB model is hardware-oriented. Its representation is close to what most monitors show. In contrast, HSV represents color in a way more suited to the human perception of color. For example, the relationships "stronger than", "darker than" and "the opposite of" are easily expressed in HSV but are much harder to express in RGB. H, for hue, is either 0-359 if the color is chromatic (not gray), or meaningless if it is gray. It represents degrees on the color wheel familiar to most people. Red is 0 (degrees), green is 120 and blue is 240. S, for saturation, is 0-255, and the bigger it is, the stronger the color is. Grayish colors have saturation near 0; very strong colors have saturation near 255. V, for value, is 0-255 and represents lightness or brightness of the color. 0 is black; 255 is as far from black as possible. Here are some examples: Pure red is H=0, S=255, V=255. A dark red, moving slightly towards the magenta, could be H=350 (equivalent to -10), S=255, V=180. A grayish light red could have H about 0 (say 350-359 or 0-10), S about 50-100, and S=255. Qt returns a hue value of -1 for achromatic colors. If you pass a too-big hue value, Qt forces it into range. Hue 360 or 720 is treated as 0; hue 540 is treated as 180. See also QPalette, QColorGroup, QApplication::setColorSpec(), Color FAQ, Widget Appearance and Style, Graphics Classes, and Image Processing Classes. The type of color specified, either RGB or HSV, e.g. in the QColor::QColor( x, y, z, colorSpec) constructor. Constructs a color with the RGB value r, g, b, in the same way as setRgb(). The color is left invalid if any or the arguments are illegal. Constructs a color with the RGB or HSV value x, y, z. The arguments are an RGB value if colorSpec is QColor::Rgb. x (red), y (green), and z (blue). All of them must be in the range 0-255. The arguments are an HSV value if colorSpec is QColor::Hsv. x (hue) must be -1 for achromatic colors and 0-359 for chromatic colors; y (saturation) and z (value) must both be in the range 0-255. See also setRgb() and setHsv(). Constructs a color with the RGB value rgb and a custom pixel value pixel. If pixel == 0xffffffff (the default), then the color uses the RGB value in a standard way. If pixel is something else, then the pixel value is set directly to pixel, skipping the normal allocation procedure. Constructs a named color in the same way as setNamedColor() using name name. The color is left invalid if name cannot be parsed. Constructs a color that is a copy of c.
Allocates the RGB color and returns the pixel value. Allocating a color means to obtain a pixel value from the RGB specification. The pixel value is an index into the global color table, but should be considered an arbitrary platform-dependent value. The pixel() function calls alloc() if necessary, so in general you don't need to call this function. Returns the B (blue) component of the RGB value. Internal clean up required for QColor. This function is called from the QApplication destructor. Returns the current color allocation context. The default context is 0. See also enterAllocContext() and leaveAllocContext(). Returns a darker color if factor is greater than 100. Setting factor to 300 returns a color that has one-third the brightness. Returns a lighter color if factor is less than 100. We recommend using lighter() for this purpose. If factor is 0 or negative, the return value is unspecified. Destroys a color allocation context, context. This function deallocates all colors that were allocated in the specified context. If context == -1, it frees up all colors that the application has allocated. If context == -2, it frees up all colors that the application has allocated, except those in the default context. The function does nothing for true color displays. See also enterAllocContext() and alloc(). Enters a color allocation context and returns a non-zero unique identifier. Color allocation contexts are useful for programs that need to allocate many colors and throw them away later, like image viewers. The allocation context functions work for true color displays as well as for colormap displays, except that QColor::destroyAllocContext() does nothing for true color. The example code loads a pixmap from file. It frees up all colors that were allocated the last time loadPixmap() was called. The initial/default context is 0. Qt keeps a list of colors associated with their allocation contexts. You can call destroyAllocContext() to get rid of all colors that were allocated in a specific context. Calling enterAllocContext() enters an allocation context. The allocation context lasts until you call leaveAllocContext(). QColor has an internal stack of allocation contexts. Each call to enterAllocContex() must have a corresponding leaveAllocContext(). You may also want to set the application's color specification. See QApplication::setColorSpec() for more information. See also leaveAllocContext(), currentAllocContext(), destroyAllocContext(), and QApplication::setColorSpec(). Returns the current RGB value as HSV. The contents of the h, s and v pointers are set to the HSV values. If any of the three pointers are null, the function does nothing. The hue (which h points to) is set to -1 if the color is achromatic. Warning: Colors are stored internally as RGB values, so getHSv() may return slightly different values to those set by setHsv(). See also setHsv() and rgb(). Sets the contents pointed to by r, g and b to the red, green and blue components of the RGB value respectively. The value range for a component is 0..255. See also rgb(), setRgb(), and getHsv(). Returns the G (green) component of the RGB value. This function is obsolete. It is provided to keep old source working. We strongly advise against using it in new code. Use getHsv() instead. Internal initialization required for QColor. This function is called from the QApplication constructor. Returns FALSE if the color is invalid, i.e. it was constructed using the default constructor; otherwise returns TRUE. Examples: chart/element.cpp, chart/setdataform.cpp, and scribble/scribble.cpp. Leaves a color allocation context. See enterAllocContext() for a detailed explanation. See also enterAllocContext() and currentAllocContext(). Returns a lighter color if factor is greater than 100. Setting factor to 150 returns a color that is 50% brighter. Returns a darker color if factor is less than 100. We recommend using dark() for this purpose. If factor is 0 or negative, the return value is unspecified. Returns the maximum number of colors supported by the underlying window system if the window system uses a palette. Otherwise returns -1. Use numBitPlanes() to calculate the available colors in that case. Returns the name of the color in the format "#RRGGBB", i.e. a "#" character followed by three two-digit hexadecimal numbers. Returns the number of color bit planes for the underlying window system. The returned value is equal to the default pixmap depth. Returns TRUE if this color has a different RGB value from c; otherwise returns FALSE. Assigns a copy of the color c and returns a reference to this color. Returns TRUE if this color has the same RGB value as c; otherwise returns FALSE. This value is used by the underlying window system to refer to a color. It can be thought of as an index into the display hardware's color table, but the value is an arbitrary 32-bit value. Returns the pixel value for screen screen. Returns the R (red) component of the RGB value. The return type QRgb is equivalent to unsigned int. See also setRgb(), hsv(), qRed(), qBlue(), qGreen(), and isValid(). Sets a HSV color value. h is the hue, s is the saturation and v is the value of the HSV color. If s or v are not in the range 0-255, or h is < -1, the color is not changed. See also hsv() and setRgb(). Examples: drawdemo/drawdemo.cpp, grapher/grapher.cpp, and progress/progress.cpp. A name from the X color database (rgb.txt) (e.g. "steelblue" or "gainsboro"). These color names also work under Windows. Sets the RGB value to r, g, b. The arguments, r, g and b must all be in the range 0..255. If any of them are outside the legal range, the color is not changed. See also rgb() and setHsv(). Sets the RGB value to rgb. The type QRgb is equivalent to unsigned int. Writes a color object, c to the stream, s.
Reads a color object, c, from the stream, s.
Returns the alpha component of the RGBA quadruplet rgba. Returns the blue component of the RGB triplet rgb. Returns a gray value 0..255 from the (r, g, b) triplet. The gray value is calculated using the formula (r*11 + g*16 + b*5)/32. Returns a gray value 0..255 from the given rgb colour. Returns the green component of the RGB triplet rgb. Returns the red component of the RGB triplet rgb. Returns the RGB triplet (r,g,b). Returns the RGBA quadruplet (r,g,b,a). The return type QRgba is equivalent to unsigned int.